If you can’t tell, we are very excited that fall is here because with this comes Halloween and all of its spirit and fun! In this blog post, we will focus on some fun and easy do-it-yourself (DIY) recipes for a spooky Halloween party (be sure to check out our last post on some elegant DIY decor ideas as well). 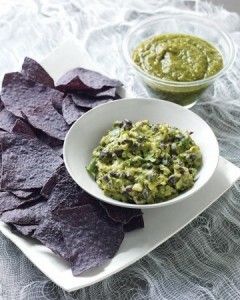 Treat #1: Guacamole with black tortilla chips. This is so simple and works so well for the spooky theme. Add some black beans to your guacamole for an extra ghoulish twist. Treat #2: Shriveled potatoes with dipping sauce. This subtly spooky appetizer is easy to whip up but impressive to taste. 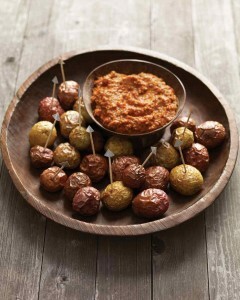 Martha Stewart has a great recipe for this treat with romesco sauce on her blog (click here). Treat #3: Cheese & meat platter with small signs to help with the imagination. 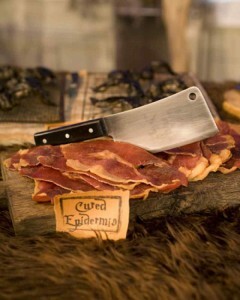 Think pruschetto (“cured epidermis”), cheddar cheese (“brain cheese”), gherkin pickles (“witches toes”)…you get the point. Get creative and you really can’t go wrong! 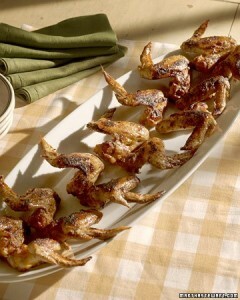 Treat #4: Going along with the cheese & meat platter theme, serve chicken wings and add a small sign that says “bat wings.” Disguised as creatures of the night, these will be a real hit. 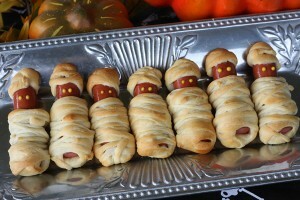 Treat #5: Try mummies in a blanket for a fun spin on pigs in a blanket. All you needs are some mini hot dogs or sausages and a tube of breadstick dough or crescent dough. Wrap it around the dogs in thin pieces for the mummy effect, and you have yourself a spooky treat! My Recipes has an easy-to-follow recipe for this on their blog (click here). 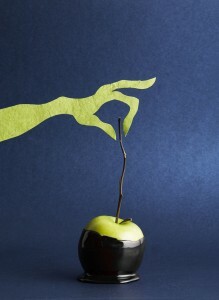 Treat #6: Try a sinister twist on candy apples. Use green apples and dip them in black candy sugar (with the help of some black food dye, or opt out and dip in dark chocolate instead). For the stick, try some twigs from your yard! Country Living has a quick and simple recipe to nail this spooky treat (click here). Treat #7: Serve a couple of different ghoulish punches at your party. Try a blood red recipe or a dark cider to keep the festive theme going. Food Network has a cold non-alcoholic “Dragon’s Blood Punch” recipe on their blog (click here) as well as a recipe for hot apple cider with rum (click here). 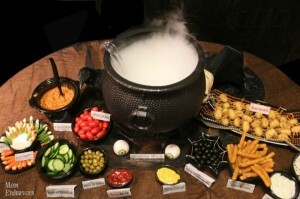 Get really into the spirit and add some dry ice for a smoky, spooky effect! The best way to do this is to use two bowls, one that can fit inside the other. You will put the dry ice in the large bowl (try a cauldron from your local party store) and then place your bowl of punch on top. It will look like the punch is smoking, but it’s really coming from around the edges. Watch how it’s done on this youtube tutorial (click here). Black out the rest of your treats to continue the eerie theme and you will be all set. Serve a bowl of dark chocolate covered popcorn, a platter of chocolate cupcakes, black grapes and blackberries…the options are endless. Enjoy your spooktacular party…with these treats, we know your guests will! Stay tuned to the Zerorez Oklahoma Blog for additional DIY tips on spooky (& simple) costumes, eerie outdoor decor, and more! Check out our DIY tips on elegant party decor for a halloween party.